To Cite: Javanmard D, Alavian S M, Abedi F, Namaei M H, Asghari A, et al. High Prevalence of Hepatitis B Virus Infection in the Village of Esfandiar in South Khorasan Province, Iran, Hepat Mon. 2018 ; 18(8):e65473. doi: 10.5812/hepatmon.65473. Background: Infection with Hepatitis B virus (HBV) is still a leading cause of cirrhosis and hepatocellular carcinoma around the world. Objectives: Having recently received reports of high HBV prevalence in the South Khorasan Province in the Esfandiar village, we aimed to evaluate the prevalence of HBV in this region in comparison to neighboring villages, with associations to risk factors. Methods: This was a cross sectional study that included the Esfandiar village and neighboring villages, Marghoub, and Zenowghan. All of the Esfandiar and certain neighboring villages were summoned and blood sampling was performed along with the completion of a questionnaire. Positivity for HBsAg, anti-HBc along with the seromarkers of HCV and HDV were assayed using ELISA method. Statistical analysis was performed using the SPSS software with chi-square tests, logistic regression, and risk-estimation analysis. Results: From total 1.245 participants, 856, 172, and 217 cases were from the Esfandiar, Marghoub, and Zenowghan villages, respectively. The prevalence of anti-HBc in the Esfandiar, Marghoub, and Zenowghan were 48.7%, 20.3%, and 7.8%, respectively (P-value: 0.001). The figures for HBsAg were 17.8 %, 1.7 %, and 0.5 %, respectively (P-value: 0.001). HBV was more prevalent among those with a history of experimental dentistry, traditional phlebotomy, war veterans, endoscopy, and familial history of HBV. In Esfandiar, prevalence of HBsAg among below and above 22 years- old (beginig of natoinal HB vaccination) were 2.3% and 22.4%, respectively (P-value < 0.001). Conclusions: There was a very high prevalence of HBV in this small endemic region. The result showed the impressive effect of neonatal vaccination on reducing the incidence of hepatitis B, by 89.7%. Thus, the high prevalence requires an urgent consideration of organizing health programs and certain sociocultural behaviors. Hepatitis B virus (HBV) is the most prevalent viral hepatitis type that has led to liver diseases around the world. Despite the availability of an effective vaccine, approximately 2 billion people have been infected by the virus worldwide, with more than 257 million chronic cases that caused 887.000 deaths in 2015 (1). Exposure to blood and blood products is the usual route of HBV transmission. In low endemic regions, the virus appears to be transmitted through sexual and needle stick exposures (2), although in high endemic areas, it seems to occur during childhood, either maternally or through a horizontal interfamilial route (3). The majority of these individual infections occur before birth or during early childhood (4). In Iran, the prevalence of HBV in different provinces ranged from 0.76% to 5.1%, and the overall prevalence is estimated to 1.84 % (5). Around the world, the prevalence of HBV ranges from high prevalence (more than 8%), intermediate (between 2 - 8%), and low prevalence (under 2%) (6). HBV infection can be prevented by active immunization through vaccination. HBV has a recombinant HBsAg vaccine that is produced and distributed all over the world. The implementation of universal HBV vaccination has reduced the incidence of this viral infection dramatically (7). The neonatal vaccination was implemented in Iran from 1993 as a nationwide health program with 99% coverage (8). In different geographical regions, various risk factors have been attributed to HBV. Thus, determining these risk factors are very important for controlling and preventing health programs (9). The most well-known behaviors that have been attributed to transmission of HBV are HBsAg positivity in pregnancy, transfusion, hospitalization, and also getting tattoos and ear piercings, the sexual activities of heterosexuals and homosexuals, intravenous drug abuse, and addiction (10). In most regions of Iran, the older ages and marriage have been related to higher prevalence of HBV (9, 11-13). In some other regions, it was reported some unusual risk factors such piercing, traditional cupping, and endoscopy (9, 14). Esfandiar is a rural area around the city of Tabas in the South Khorasan Province of Iran, which covers an area of about 680,000 km2 and includes a total population of 1,200. The distance between Esfandiar to neighboring villages, Marghoub is 5 km and its distance to Zenowghan is 12 km. According to the primary reports from the health center in the Esfandiar, there was many registered cases that tested positive for HBV. Therefore, this project aimed to evaluate the prevalence and the associated risk factors of HBV among the participants of Esfandiar and compare them with adjacent areas. Such data are fundamental for health planners and caregivers for evidence-based intervention, creating awareness for health professionals and baseline information for a later large-scale study. This cross-sectional community-based study was designed so that all of the Esfandiar and parts of the neighboring villages, as comparison group were covered. The project started in January 2016 and this study was completed in February 2017. After coordination with local authorities, the interviewers went door to door, providing the people of the region with reference dates for sampling and questioning after the introduction of goals. Almost all the residents of Esfandiar, including all age ranges, males, females, and even those who temporary lived or worked in another region (i.e., students, officials, relatives, etc.) were called to enroll in the study. There were two villages close to the Esfandiar, Marghoub and Zenowghan, which had shared many travels, jobs and had family ties. Result of a pilot study revealed low prevalence of HBV in neighboring villages as low as the norm of country. A simple random sampling method was implemented for sampling from neighboring villages. There was a registration code for each person in the health center; the code numbers were randomly selected so that half the populations of the two villages were selected for the comparison group. All socio-demographic information and data on potential risk factors were collected using a structured questionnaire by an experienced midwife nurse. The sampling and the questioning process was performed in the health center of Esfandiar village. Approximately 5 mL of venous blood was collected from each participant, transported in a gel tube for clotting. After clotting, the serum was separated and divided in three micro-tubes; on the same day, the serum was transported to the Birjand University of Medical Science (BUMS) in cold boxes. Detection of antibody against the hepatitis B-core (anti-HBc) was performed using a commercially available enzyme-linked immunosorbent assay kit (anti-HBc, Biokit, Barcelona, Spain). Seropositive specimens were tested for HBsAg (HBsAg, Dade Behring, Germany) and antibodies against the HDV (Biokit, Barcelona, Spain). All samples have also been tested for anti-HCV (HCV Antibody ELISA kit, Pishtazteb, Iran). Ethical issues were mentioned in the ethical committee of BUMS and approved under ethic code number of ir.bums.Rec.1396.187. An informed consent was signed by each patient and all the patients information was kept confidential. All demographic, clinical, and serological data were entered into the SPSS software (Version 19). The chi-square tests were used to compare the frequencies between groups. Risk estimation analysis was performed for the univariate analysis of risk factors. For multivariate analysis of risk factors, logistic regression was used. This study included a total of 1,245 participants; it focused on the Esfandiar village (856 cases) and the neighboring villages as the comparison group (172 cases from Marghoub and 217 from Zenowghan). Brief demographic characteristics of all the participants were provided in Table 1. The mean age of Esfandiar participants was 34 ± 19.6 years, ranging from newborns up to 95 years old. The mean age among the comparing villages, Marghoub and Zenowghan, was 33.5 ± 20.2 and 40.3 ± 16.3, respectively, which ranged from newborns to 86 years of age. The serological test showed that the overall prevalence of HBsAg in Esfandiar was 17.8%; the overall prevalence of HBsAg in the neighboring villages namely Marghoub and Zenowghan were 1.7% and 0.5%, respectively (P-value: 0.001). The prevalence of anti-HBc in Esfandiar, Marghoub, and Zenowghan were 48.7%, 20.3%, and 7.8%, respectively (P-value: 0.001). In the village of Esfandiar, the mean age of HBsAg positives versus negatives was 46.7 ± 17.2 and 28.1 ± 16.2 years, respectively. According to age ranges, the prevalence of anti-HBc and HBsAg showed an increasing profile toward aging. The prevalence of HBsAg was significantly higher in individuals older than 25 years (P-value: 0.001) (Figure 1). Among the males and the females of the Esfandiar, the prevalence of HBsAg was 19.2% and 16.5%, respectively (P-value: 0.412); in the comparison group, corresponding result was 1.4% versus 2% for Marghoub and 1.3% versus 0 for Zenowghan among males and females, respectively. Prevalence of HbsAg between both genders in two groups was significantly different (P-value = 0.005). In the Esfandiar, according to marital status, the prevalence of HBsAg were most prevalent among married people (24.9%), while it was 2.6 percent among single individuals (P-value = 0.024); the rates were 3.1% versus 0 and 0.5% versus 0 for married and single cases in Marghoub and Zenowghan, respectively. Among the specimens, none were positive for HCV and HDV nor in the Esfandiar neither in neighboring villages. The national HB vaccination program had started 22 years earlier, so prevalence of HBsAg among participant below and above 22 years-old in Esfandiar were 2.3% and 22.4%, respectively (P-value < 0.001). Neonatal vaccination agaist the HBV led to 89.7% reduciton incidence for HBV since 22 years earler. For anti-HBc, it decreased from 66% to 10.7% (P-value < 0.001). In comparing villages, the prevalence of HBsAg decreased from 1.8% to 1.6% in Marghoub and from 0.5% to 0% in Zenowghan (P-value: 0.903). The rate of most of risk factors among the comparing villages was somewhat similar to the result of Esfandiar (Table 2). Among the risk factors analyzed in the comparison group, just history of prison was associated with a higher risk of HBV infection (OR; 13.9, CI = 1.3 - 146), and the frequency of HBsAg or anti-HBc were not as high as been significant for another risk factors. The brief history and rates of exposure to different types of risk factors among the participants of Esfandiar are given in Table 3. In the Esfandiar village and according to the questionnaires, 158 cases (20%) reported that had at least one HBV positive member in their families (risk factor “familial history of HBV”), among whom the prevalence of HBsAg and anti-HBc were 29.1% and 62.7%, respectively (OR: 3.1, CI = 95%: 2 - 4.7, for HBsAg). The prevalence of HBsAg among the 0.5% of comparisons with familial history of HBV was zero. Thirteen cases (1.6%) were traced to had military disabilities or injuries (war veteran), among whom 100% were positive for anti-HBc and 38.5% for HBsAg (OR: 3.4, CI = 95%:1.1 - 10.5, for HBsAg); while among 1% of comparison group that had war injuries no one was HBsAg positive. Univariate analysis has showed that those with a history of bloodletting procedures (phlebotomy or traditional cupping- HEJAMAT) were more prone to test positive for HBsAg (OR: 2.2, CI = 95%: 1.4 - 3.5); among 16% of comparison group who had cupping history, no one tested positive for HBV. This result was also significant for those who had a history of endoscopy and experimental dentistry practices (Table 3). Among the comparison group, the rate of experimental dentistry and endoscopy were 9.8% and 4.9% respectively, and the prevalence of HBV among them was zero. In multivariate analysis of risk factors, individuals above 22 years old and familial history of HBV had significant effect for high prevalence of HBsAg (Table 3). aThe crude and adjusted ORs define the risk for HBsAg, and P- value is for crude OR. bPhelbotomy or HEJAMAT indicate traditional bloodletting procedures. cThose who experience and obtain dental skills wihtout academic degree. dHistory of constant non- injecting consuming opioid for at least 12 months. eIllegal sexual relationship outside of the custom and outside the family. fSurgeries such as fracture treatment, heart surgery, cesarean section and in general any type of practices requiring anesthesia and at least two nights hospitalization. gIncluding war injuries and disabilities. hSelf report of participants from a known HBV case in the family. Recent studies carried out throughout Iran have shown that the epidemiology of HBV in Iran is changing, and in recent decades it has decreased dramatically among the general population (8). In this survey, we reported the highest prevalence of HBV in Iran in a rural population in the Esfandiar village. The overall prevalence of HBsAg and anti-HBc in the Esfandiar was 17.8 and 48.7 percent, respectively. These results indicate some degree of endemicity for this infection in this area as its level can be categorized as endemic level, according to criteria of the World Health Organization (6). This figure is much higher than most reports around Iran; for example, the highest prevalence of HBV in the general population reported from the Golestan Province was 9.7% (15) and the lowest prevalence was from the Kermanshah Province, 0.7% (16). However, HBV prevalence as high as 18% has been reported in Iranian gypsies as a high-risk group in the Shahre-E-Kord Province (17). According to a recent meta-analysis, the pooled estimated prevalence of HBV in Iran was 2.2% (18), and in a later one it estimated 1.84% (6). In a recent community-based survey in Southern Khorasan province, the HBV prevalence in urban citizens was 1.6% (9) and among the high-risk groups of this province, between prisoners was 6.9% (14). An interesting finding in this study was the increasing prevalence of HBsAg with age; the result was more than 30% in ages over 45 years, but it decreased to the norm of country in individuals younger than 22 years. This is mostly due to the national vaccination program, especially in younger people, which has been highlighted in the last two decades. This study demonstrated the impressive effect of national HB vaccine; the prevalence of HBsAg in ages lower and higher than 22 years was 2.3% and 23% respectively. This result is consistent with other reports from IR (8, 11, 12) and is explained through a public vaccination program for newborns and teenagers as well as the availability of an effective vaccine. The common risk factors for the transmission of HBV were rarely reported among the Esfandiar village and also in the comparing villages. With regard to the high burden of HBV in the Esfandiar, the reported rate of injecting drug abuse, multiple sexual partners, needle sticks and etcetera were negligible. Despite dramatic differences in the HBV prevalence between Esfandiar and comparing villages, the result of the risk factors in three villages was somewhat similar. Phlebotomy (HEJAMAT) as a traditional medical action, which is more common among gypsies and rural people, was determined as a risk factor for the transmission of HBV in Esfandiar (OR: 2.2, CI = 95%: 1.4 - 3.5) but not in the comparison group. This risk factor was introduced as being risky in certain other studies of Iran (14, 17, 19, 20). In other regions of the world, mostly the Middle East and Muslim countries, where bloodletting procedures are common such as Saudi Arabia (21) and Sierra Leone (22) it has been reported as a risk factor of HBV. Another significant risk factor was history of experimental dentistry practices (OR: 2.2, CI = 95%: 1.3 - 3.9); this risk factor was rarely reported elsewhere (23), although it is known that dentists are at risk of infection with HBV (24). As it was expected, the risk of being positive for HBV was much higher in those with familial history of HBV (OR: 3.1, CI = 95%: 2 - 4.7). This finding assumed that the interfamilial transmission of HBV and the neonatal route are the main transmission avenues of HBV in this endemic region, as well as other high prevalence regions around the world (25). The familial transmission risk factor has been reported elsewhere in Iran (26-28) and around the world (29, 30). An unexpected finding of this study was the higher risk of HBV in war veterans and military-related disabilities (OR: 3.4, CI = 1.1 - 10.5). Being a veteran and having been injured in the battlefield are rarely studied as risk factors for HBV. In a previous study among military forces with some level of disability it was reported a high prevalence of HBV (4.8%) and HCV (0.7%) (31). Endoscopy was another risk factor that was related to higher prevalence of HBV (OR: 2.2, CI = 95%: 1.1 - 4.4), which seemed to be rarely reported from Iran, although its risk for the transmission of HBV has been previously reported (9, 32, 33). In multivariate analysis of risk factors, “familial history of HBV” and “ages more than 22 years” had significant risk for being positive for HBV, and other risk factors have lost their impact, probably under the effect of age. These results show the important and positive effect of the neonatal HB vaccine in reducing the prevalence of HBV. Endoscopy, HEJAMAT, military injuries and similar risk factors that have been significant in univariate analysis are indirectly affected by age, since most of these occur in adulthoods. Therefore, as they have been also addressed in some previous reports they should be considered in future studies for the exact assessment of risk estimation. As an epidemiologic study, most outstanding limitations of this study were the absence of some information such as identity of family members, and titration of HBs-Ab that could be helpful in interpretation of result. In brief, this study introduced a high endemic region of HBV in Iran, which requires more screening and treatment follow-ups. Existence of certain uncommon traditional behaviors and risk factors indicates a low socio-cultural level, which needs more effective educational cultural programs in this region. This study showed the impressive effect of HB vaccine especially early vaccination of neonate in prevention of HBV, so more consideration in poor and far areas of Iran as well as other regions of the world is suggested. This project was fully supported by the Birjand University of Medical Sciences (BUMS). The sincere assistance of the Esfandiar and Marghoub health personnel, the inhabitants of villages, and the BUMS Deputy of Health is deeply appreciated. 1. WHO. Hepatitis B fact sheet N°204 Geneva: world health organization. 2017, [cited updated July 2017]. Available from: http://www.who.int/mediacentre/factsheets/fs204/en/. 2. Ochola E, Ocama P, Orach CG, Nankinga ZK, Kalyango JN, McFarland W, et al. High burden of hepatitis B infection in Northern Uganda: results of a population-based survey. BMC Public Health. 2013;13(1):727. doi: 10.1186/1471-2458-13-727. [PubMed: 23919752]. [PubMed Central: PMC3751632]. 3. Franco E, Bagnato B, Marino MG, Meleleo C, Serino L, Zaratti L. Hepatitis B: epidemiology and prevention in developing countries. World J Hepatol. 2012;4(3):74. doi: 10.4254/wjh.v4.i3.74. 4. Bayo P, Ochola E, Oleo C, Mwaka AD. High prevalence of hepatitis B virus infection among pregnant women attending antenatal care: a cross-sectional study in two hospitals in northern Uganda. BMJ Open. 2014;4(11). e005889. doi: 10.1136/bmjopen-2014-005889. [PubMed: 25387757]. [PubMed Central: PMC4244481]. 5. Hajarizadeh B, Mesgarpour B, Nasiri MJ, Alavian SM, Merat S, Poustchi H, et al. Estimating the Prevalence of Hepatitis B Virus Infection and Exposure Among General Population in Iran. Hepat Mon. 2017;17(8). doi: 10.5812/hepatmon.11715. 6. Shepard CW, Simard EP, Finelli L, Fiore AE, Bell BP. Hepatitis B virus infection: epidemiology and vaccination. Epidemiol Rev. 2006;28(1):112-25. doi: 10.1093/epirev/mxj009. [PubMed: 16754644]. 7. Zanetti AR, Van Damme P, Shouval D. The global impact of vaccination against hepatitis B: a historical overview. Vaccine. 2008;26(49):6266-73. doi: 10.1016/j.vaccine.2008.09.056. [PubMed: 18848855]. 8. Alavian SM, Fallahian F, Lankarani KB. The changing epidemiology of viral hepatitis B in Iran. J Gastrointestin Liver Dis. 2007;16(4):403-6. [PubMed: 18193122]. 9. Ziaee M, Ebrahimzadeh A, Azarkar Z, Namaei MH, Saburi A, Fereidouni M, et al. Seroprevalence and risk factors for hepatitis B in an adult population: the first report from Birjand, south Khorasan, Iran. Hepatit Mon. 2016;16(9). doi: 10.5812/hepatmon.36452. 10. Janahi EM. Prevalence and risk factors of hepatitis B virus infection in Bahrain, 2000 through 2010. PLoS One. 2014;9(2). e87599. doi: 10.1371/journal.pone.0087599. [PubMed: 24498341]. [PubMed Central: PMC3911996]. 11. Alavian SM, Tabatabaei SV, Ghadimi T, Beedrapour F, Kafi-Abad SA, Gharehbaghian A, et al. Seroprevalence of hepatitis B virus infection and its risk factors in the west of Iran: a population-based study. Int J Prev Med. 2012;3(11):770-5. [PubMed: 23189228]. [PubMed Central: PMC3506088]. 12. Ghadir MR, Belbasi M, Heidari A, Jandagh M, Ahmadi I, Habibinejad H, et al. Distribution and risk factors of hepatitis B virus infection in the general population of Central Iran. Hepat Mon. 2012;12(2):112-7. doi: 10.5812/hepatmon.822. [PubMed: 22509188]. [PubMed Central: PMC3321318]. 13. Shakeri MT, Foghanian B, Nomani H, Ghayour-Mobarhan M, Nabavinia MS, Rostami S, et al. The prevalence of hepatitis B virus infection in mashhad, iran: a population-based study. Iran Red Crescent Med J. 2013;15(3):245-8. doi: 10.5812/ircmj.8200. [PubMed: 23984006]. [PubMed Central: PMC3745755]. 14. 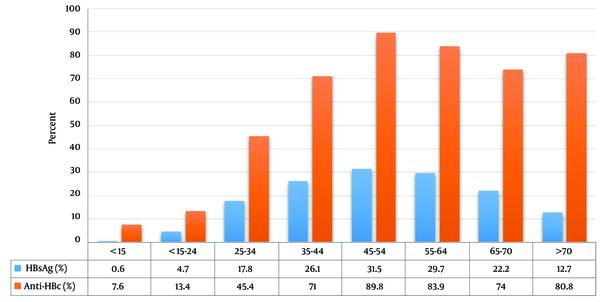 Ziaee M, Sharifzadeh G, Namaee MH, Fereidouni M. Prevalence of HIV and hepatitis B, C, D infections and their associated risk factors among prisoners in Southern Khorasan Province, Iran. Iran J Public Health. 2014;43(2):229-34. [PubMed: 26060747]. [PubMed Central: PMC4450691]. 15. Gholamreza R, Shahryar S, Abbasali K, Hamidreza J, Abdolvahab M, Khodaberdi K, et al. Seroprevalence of hepatitis B virus and its co-infection with hepatitis D virus and hepatitis C virus in Iranian adult population. Indian J Med Sci. 2007;61(5):263-8. [PubMed: 17478956]. 16. Alavian SM, Tabatabaei SV, Nourizad S, Mansouri F, Khademi N, Amini Kafi-abad S, et al. Seroepidemiology of HBV infection in Kermanshah- west of Iran; a population based study. Jundishapur J Microbiol. 2012;5(4):564-9. doi: 10.5812/jjm.4156. 17. Asl H, Kazem S, Avijgan M, Mohamadnejad M. High prevalence of HBV, HCV, and HIV infections in gypsy population residing Shahr-e-Kord. Arch Iran Med. 2004;7(1):20-2. 18. Salehi-Vaziri M, Sadeghi F, Almasi Hashiani A, Gholami Fesharaki M, Alavian SM. Hepatitis B virus infection in the general population of Iran: an updated systematic review and meta-analysis. Hepatit Mon. 2016;16(4). doi: 10.5812/hepatmon.35577. 19. Merat S, Rezvan H, Nouraie M, Jamali A, Assari S, Abolghasemi H, et al. The prevalence of hepatitis B surface antigen and anti-hepatitis B core antibody in Iran: a population-based study. Arch Iran Med. 2009;12(3):225-31. [PubMed: 19400598]. 20. Fathimoghaddam F, Hedayati-Moghaddam MR, Bidkhori HR, Ahmadi S, Sima HR. The prevalence of hepatitis B antigen-positivity in the general population of Mashhad, Iran. Hepat Mon. 2011;11(5):346-50. [PubMed: 22087159]. [PubMed Central: PMC3212777]. 21. Alswaidi FM, O'brien SJ. Is there a need to include HIV, HBV and HCV viruses in the Saudi premarital screening program on the basis of their prevalence and transmission risk factors? Br J Prev Soc Med. 2010:jech-2009. 22. Wurie IM, Wurie AT, Gevao SM. Sero-prevalence of hepatitis B virus among middle to high socio-economic antenatal population in Sierra Leone. West Afr J Med. 2005;24(1):18-20. [PubMed: 15909704]. 23. Sali S, Bashtar R, Alavian SM. Risk factors in chronic hepatitis B infection: a case-control study. Hepat Mon. 2005;2005(4, Autumn):109-15. 24. Manfredi R. Occupational exposure and prevention guidelines in dental and stomatological settings - a literature review. Infectio. 2010;14(1):68-83. doi: 10.1016/s0123-9392(10)70094-1. 25. Ducancelle A, Abgueguen P, Birguel J, Mansour W, Pivert A, Le Guillou-Guillemette H, et al. High endemicity and low molecular diversity of hepatitis B virus infections in pregnant women in a rural district of North Cameroon. PLoS One. 2013;8(11). e80346. doi: 10.1371/journal.pone.0080346. [PubMed: 24265811]. [PubMed Central: PMC3827216]. 26. Moezzi M, Imani R, Khosravi N, Pourheidar B, Ganji F, Karimi A. Hepatitis B seroprevalence and risk factors in adult population of chaharmahal and bakhtiari province in 2013. Hepat Mon. 2014;14(5). doi: 10.5812/hepatmon.17389. 27. Kassaian N, Ataei B, Javadi AA, Farajzadegan Z, Adibi P. Hepatitis B markers in Isfahan, Central Iran: a population-based study. Hepat Mon. 2009;2009(1, Winter):12-6. 28. Kayvani H, Sohrabi M, Zamani F, Poustchi H, Ashrafi H, Saeedian F, et al. A population based study on hepatitis B virus in northern Iran, Amol. Hepat Mon. 2014;14(8). doi: 10.5812/hepatmon.20540. 29. Ragheb M, Elkady A, Tanaka Y, Murakami S, Attia FM, Hassan AA, et al. Multiple intra-familial transmission patterns of hepatitis B virus genotype D in north-eastern Egypt. J Med Virol. 2012;84(4):587-95. doi: 10.1002/jmv.23234. [PubMed: 22337297]. 30. Gunardi H, Iskandar MY, Ie SI, Dwipoerwantoro PG, Gani RA; Turyadi, et al. Hepatitis B virus infection in children of HBV-related chronic liver disease patients: a study of intra-familial HBV transmission. Hepatol Int. 2017;11(1):96-104. doi: 10.1007/s12072-016-9764-z. [PubMed: 27624502]. 31. Alavian SM, Rajai M, Arab MS, Gashtasebifar S, Emadi V, Nejatbakhsh P. Viral hepatitis in iranian armed forces: prevalence of HBV and HCV in the wounded-in-action (WIA). Hepat Mon. 2005;5(4):129. 32. Ishino Y, Ido K, Sugano K. Contamination with hepatitis B virus DNA in gastrointestinal endoscope channels: risk of infection on reuse after on-site cleaning. Endoscopy. 2005;37(6):548-51. doi: 10.1055/s-2005-861316. [PubMed: 15933928]. 33. Wu H, Shen B. Health care-associated transmission of hepatitis B and C viruses in endoscopy units. Clin Liver Dis. 2010;14(1):61-8. viii. doi: 10.1016/j.cld.2009.11.012. [PubMed: 20123440].